Emotional safety has many dimensions, such as: the impact of the family and early development, childhood stress and coping, the changing role of the school, acceptance and emotional support, respect and belonging, temperament and labels, gangs and violence, instructional strategies, learning styles and multiple intelligences, teacher training and support, and the inherent need for a sense of community. The message Jane Bluestein brings is positive: information, programs and solutions are available that can ultimately make our schools inviting, inspiring, and, yes-safe. The starting point for a better world is the belief that it is possible. There's this commercial that begins by showing us a couple standing on top of a medieval castle. As the camera pulls back, we see that the castle is actually a chess piece on a board between two people riding on a train. The camera pulls back again and we see the train through the window of a houseas part of a model railroad in a family's playroom. Each time we step back, we realize that each world-within-a-world, complete as each seemed to be, is simply a part of a much larger reality. The continual change in perspective is both breathtaking and brilliant, an important reminder about how an image or event can, in fact, simply be one small facet of a far bigger reality. So it goes with safety in schools. Invariably, whenever somebody brings up the topic, the conversation seems to focus on one little piece of this realityusually a headline-grabbing instance of violence or vandalism. However, if we apply the "big picture" perspective to this issue, we realize that the more extreme breaches of school safety are only a very small part of a much larger issue. Unfortunately, despite our efforts to place these events in a larger context, we can easily become fixated on the intensity of a terrible moment, and lose our sense of the multidimensional reality in which the events occurred. When our focus narrows to one little corner of the picture, we can neglect the millions of other details that are also a part of the scenery, much less how all these threads are woven together or how they impact one another. When our vision fails to go beyond the immediacy of the moment, our lack of perspective can have serious consequences, particularly with regard to how we respond to the event and the solutions we propose. Certainly safety is an issue whenever violence occurs. But it's also an issue for the student who is terrified of being called on to give an oral presentation to the class, the kid anticipating being harassed or attacked on the playground, or the child who knows that the end of the school day leads back to an unstable or violent home. It's an issue for kids who don't test well, for kids who learn best by touching and moving, and for kids whose strengths lie in areas the schools neither assess nor value. It's an issue for the child nobody notices, the child nobody will play with, the child who camouflages inadequacy with a string of achievements. It's an issue for nonlinear thinkers and for students who look "different." It's an issue for parents, particularly when their kids are havingor causingproblems. And it's an issue for teachers who are faced with increasing demands and inadequate resources, who are held accountable for many things over which they have very little control, and whose work often fails to generate the respect and compensation it deserves. For the most part, we haven't placed a very high premium on providing emotionally safe learning environments for kids or adults. Even when we acknowledge its importance, safety can easily become a casualty to traditions that make assessment more important than learning, or those that value subject matter over students. We sacrifice safety when we fail to notice a child in distress or ignore the hurtful behavior of one student to another, when we use tests or grades to punish, when we ignore academic needs in favor of curricular mandates. Emotional safety is undermined by sarcasm, impatience and contempt, by "gotcha" discipline policies, by pop quizzes, by teachers who yell or humiliate. In fact, emotional safety is an issue in so many situations in school that any improvement effort worth its saltas narrowly focused as that effort may need to bewill necessarily take the "whole" into account. Yet how often are policies implemented or programs adopted before their potential impact on the emotional climate of the school is taken into account? It's one thing to expect our schools to produce every type of outcome under the sunfrom higher academic performance to good citizenshipand quite another to create the type of environment in which these reasonable expectations can actually unfold. In the absence of a safe learning environment, a great deal of energy is expended in an effort to create safety, self-protecting by any means necessary, and not always in the most constructive ways. Learning is undermined and teaching is far more difficult than it needs to be. So we deal with the symptoms and react to the events, but until we quit dancing around the core issues and the dynamics that keep feeding the beast, we will continue to be disappointed when quick-fix surface solutions fail, one after the otheror make the problems even worse. So here's the deal: Let's look at the big picture and some of the factors that play into making a school climate what it is. And let's look at some of the ways that kids and adults need to feel safe before we zero in on one little corner of the room and imagine that if it's clean, the rest of the house will be just fine. Yes, it's big, but it's doable. Maybe all we need to do is step back and take in the immensity and complexity of it all, for therein lie potential and magnificence. And in the end, what could be more worthwhile? I have this recurring nightmare: I'm back in high school and I can't get out. I was a slow reader and a slow answerer. My learning style didn't "work." I was terrified. I never understood anything right. Of course I'm right-handed. I went through three years of school with my left hand tied to my desk. Forty-five years later, there are two words that still strike an icy fear in my heart: Gym Class. I was never afraid of my teachers, unless I didn't know something. Or forgot my book. Or came late. Or made a mistake. It's 1999, right before Thanksgiving, and I'm sitting down to breakfast with the Sunday paper. I reach for the comics and the color supplements, which is where I normally start, but I can't get past the headlines: Deming Girl Dies. A thirteen year-old middle-school student in southern New Mexico is now dead at the hands of a classmate, shot in the back of the head in the lobby of the school. On page two, a story about a boy the same age in Palmdale, California, dead after a fistfight in which he hit his head on the sidewalk. On the following page are details of the Texas A&M University bonfire tragedy, which killed twelve and injured twenty-seven. I haven't even been at the table ten minutes, and I've gotten a very strong message over and over in the first three pages of our local newspaper: Our schools are not safe. We read and hear much about death and violence in schools, even though fewer that 1 percent of all violent deaths of children occur on school grounds.2 In fact, assuming we can trust the numbers, schools are safer for children than their homes or communities. And yet, what gets the greatest attention and the widest coverage? Even the U.S. Department of Education's Annual Report on School Safety, which affirms that "the vast majority of America's schools are safe places," focuses much of its reporting on crime, substance abuse and violence. These statistics, and the stories we see in the papers and on the news, are important and valuable for bringing attention to the need for safety in schools. My concern is that these resources, understandably, perhaps even necessarily, work from a definition of safety that is deceptively narrow. I don't think we can expect to see sensational media accounts any time soon of the student who is berated for a wrong answer or the child who is teased and humiliated by her peers, unless, of course, these events end in violence. And while no one would presume to compare the relative traumas of a scolding to a shooting, make no mistake about it, these and countless other interactions compromise and erode the emotional climate in schools on a daily basis. These incidents, and the hundreds of other situations, techniques and exchanges that do not support basic safety needs, may be harder to spot, document or measure, but they deserve our attention, and they deserve to be taken seriously, for they, too, leave scars. It's easy to get caught up in the extreme events we have witnessed, as well as the finger-pointing and hand-wringing that occur in their wake. But the headlines also point to a host of other serious, if grossly subtler, problems, and as far as emotional safety goes, we've got bigger fish to fry. In a hierarchy of more than two dozen human needs compiled from the works of Abraham Maslow, Alice Miller, Andrew Weil and William Glasser, "safety" is number two, just above basic survival needs, like food and shelter. The need for safetyand I want to stress that I am talking about emotional and psychological safety, as well as the absence of physical threatis so basic and so important, that unless this need is met, all other higher-level needs, like the needs for belonging, success and purpose, to name a few, become extremely difficult to satisfy or achieve in healthy ways. Oh sure, most of us become masters of adaptation, and anyone who spends much time with kids with a history of not feeling safe can probably reel off a long list of behaviors and attitudes used to compensate. But this is hardly the same as learning, inquiring and relating, much less self-actualizing, and few parents or educators would suggest that we should be satisfied with compensation. We react to tragedy wanting to know why, but I want us to start asking different questions before another tragic event occurs. For the moment, at least, I'm far more concerned with how schools feel, and if kidsand their teacher'sare not looking forward to school each day as an exciting and enriching opportunity to meet their higher-level needs, I want to know what we can do to make it right. I want to know how kids and grownups are treated in school, and the degree to which all are (and feel) valued. I want to know what kinds of opportunities exist for all students, not just for learning, but for success as well. I want to know how we're listening, and how we let kids know they're worth listening to. I want to know how we're supporting personal and social development, and teaching kids ways to deal with problems and hurt feelings without hurting themselves or anyone else. I want to know, if I walk into your classroom as a student, if I will be welcome there, regardless of my previous grades and test scores, my appearance, my personality, my learning preferences or how much I love your subject area. As counselor Barbara Wills reminds, "Emotional safety is in the eye of the beholder. A place can be very safe, but if the student perceives it not to be, it isn't." The good news appears in the form of new research, new technologies and new programs, and the fact that schools throughout the world are starting to examine and address issues that go beyond the academic concerns that have grabbed the lion's share of our attention in years past, often to the exclusion of other, equally important dimensions of human growth and development. Much of the research I uncovered and many of the people I interviewed point to large numbers of individuals who are working very specifically on quests that will ultimately contribute to advances and improvements in emotional safety, whether or not that was their initial intention. And I have seen much evidence to suggest that as we strive to eliminate the emotional, psychological and even instructional injuries that children sustain in schools, we're going to see fewer and fewer headlines of horrifying violence, despite numerous other influences that could, indeed, lead children in that direction. I pray that we never see another tragedy in school and would give anything if the ones that have occurred could somehow, magically, be reversed. However, if recent violence forces us to step back and see how much this issue of safety really involves, if it bring us closer to a willingness to look at all of the factors that impact a child's life and learning (including the factors we don't want to look at or don't believe we're equipped to handle), if it can somehow take us from blame and regret to prevention and solutions, then perhaps some greater purpose will have been served. Emotional safety means seeing a smile on my teacher's face the first day of school instead of a list of rules that is taller than my arm is long. It means being able to use the word "Neanderthal" instead of "caveman" and not be made fun of because my vocabulary is too big. It means being able to go through the lunch line without fear of somebody grabbing for my money or my cupcake. It means having a teacher who hands back papers privately instead of reading the grades out loud as I pick up my test. Emotional safety is unconditional acceptance of me. Emotional safety, first and foremost, allows me to wear my natural face instead of a fake one . . . Emotional safety means being able to act, think and feel without fear. It means being able to try activities I'm not good at, express my ideas without censoring them, display my feelings and have them respected, question my teachers without fear of punishment. It means being able to take risks and expose what I don't know. It means being valued for who I am instead of how well I perform. It means that the teacher is interested in me, in my ideas and experiences . . .
A 1992 district-wide survey of over sixty-five thousand students in Houston showed that 48 percent either "disagreed" or "strongly disagreed" with the following statement: "The school is a safe place." Another 12 percent did not know. These are troubling statistics, and even without knowing the specifics of what the surveyors or students meant by the word "safe," we have to wonder about the climate, not to mention the amount of learning going on in an environment in which a sense of safety is not a given for more than half of the student population. Yet what do these numbers really tell us? The emotional climate in a school is the complex product of a huge number of factors. How a school feels on any given day can be influenced by, among other things, the condition and design of the physical structure itself, the community in which the school exists, the mental health of the adults in the building, the functionality of the families whose children attend, the political and economic climate of the area (and the world), the calendar, the weather and, perhaps, the position of the planets as well. Local events can have big impact: A community crisis, a mean-spirited editorial or even a winning football season can add a layer of energy to a school environment that hits you the second you walk in the door. Add to that the normal social hierarchies, power dynamics, agendas and unresolved personal issues that are present any time you have a group of people living or working together, and you've got a pretty volatile mix of factors, all of which have an impact on how people work, learn and interact in this environment. In order for schools to be safeand to feel safe to all concerneda number of things have to happen, and, for the most part, they have to happen together. It's much like a recipe that requires a balance of certain ingredients, procedures, techniques and sanitary considerations, none of which can be ignored or left out without affecting the final product's appearance, taste or nutritional potential. The number of factors in this instance can be more than a bit overwhelming, to be sure, but if this book does nothing else, I want it to shine some light on just how much this issue entails by addressing as many of these factors as possible. Author-educator Rita Mercier defines a safe school as one that "creates an environment for learning that allows all students, regardless of mental ability, language, culture, race, appearance, physical differences, economic status, emotional, social or physical challenges, learning styles, temperament, gender or any other diversity, to achieve their maximum potentialacademically, personally and socially." Or consider the definition by elementary counselor, Christina Mattise, created for her developmental guidance program in which emotional safety means, "I have the right to be myself and to have the freedom to learn, work and play without having my heart, my head or my body hurt." Clearly, "creating safe schools involves much more than preventing crimes on campus," as Mercier points out. In the absence of the full complement of the above safety factors, two important "saving graces" exist. One is having some place to connectthat is, having a person or a group who values and respects you, having some in-school relationship in which you can truly be yourself, or, as survey respondent Dee Brumley suggests, "having someone or a lot of someones there to support you when you fall or just need a shoulder to cry on." The second is having some place to succeed. Many of the individuals who shared their experiences with me said that they created a sense of safety in school simply by doing well there. Others claimed that they never would have made it through school if they hadn't had one class or subject areaoften music, art, theater or gymthat offered them a refuge from difficulties in other classes, mistreatment or rejection by their peers, or a miserable home life. Certainly other valuable support influences exist, in and out of the educational environment, and differences in personality and temperament will make some children far less vulnerable than others to unsafe conditions and interactions. But sadly, many children go through years of school without even these most minimal of benefits. I've had to break up a number of cliques among my faculty. I want everyone to feel that they belong in our school community. Nobody messes up with a kid in the classroom because they want to. But that's what we hear about. The lack of respect and constant criticism, from everyone from parents and upper administration to the media, makes it hard to support one another if our morale is shot. Emotional safety means I can live and work without being afraid of threats of abuse. Where parents have the right to know and participate in their child's education, but do not have the right to physically or verbally abuse the administration or staff in the school system. Where administrators, have the right to effectively manage, but not through fear, intimidation, bullying, anger or any other manner that would be construed as emotional intimidation or harassment. Just imagine the climate in a school in which all of these safety factors were present! Indeed, there are currently many, many people committed to making sure that these conditions are in place in their own classrooms, schools and districts. The point is, once we agree that creating schools that are emotionally, socially, intellectually and psychologically safein addition to being physically safeis a goal worth pursuing from a comprehensive and inclusive standpoint, we can start working to achieve the specifics described by the various safety factors above. The more of these factors that exist in any school setting, the more we increase the odds of schools not only being safe, but also feeling safeall the time and for all students and adults. As we will see, establishing such a climate has enormous implications for student learning, success and behavior. It's reassuring to know that kids are, in fact, safer in school than anywhere else, but it's well worth whatever commitment it will take to stack the odds in favor of an emotionally safe school climate, because statistics are, after all, just numbers. For even if there's only a billion-in-one chance of a house falling on you from out of the sky, if you are that "one," it can really ruin your day. (c)2001. All rights reserved. 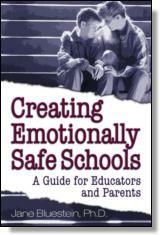 Reprinted from Creating Emotionally Safe Schools by Jane Bluestein, Ph.D. No part of this publication may be reproduced, stored in a retrieval system or transmitted in any form or by any means, without the written permission of the publisher. Publisher: Health Communications, Inc., 3201 SW 15th Street, Deerfield Beach, FL 33442.